Custom Header Logo for Forums plugin for MyBB. 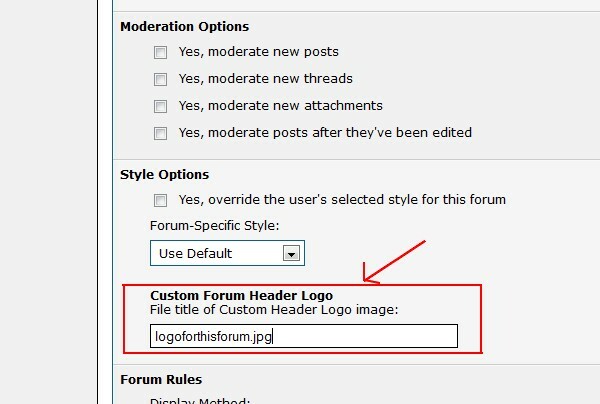 Allows you to set a custom header logo for every forum. Adds an option in ACP - Forum Management - Edit Forum. You can upload your images for custom logos to /images/logos/ in your forum directory. Go to your "AdminCP Configuration - Plugins" and click "Install & Activate" behind "Custom Header Logo for Forums". After activation you'll find a new option in "ACP - Forums&Posts -> *yourforum* -> Edit Forum" below "Style Options". Here you can enter the file title of the logo image for this forum (e.g. logofornewsblabla.jpg). The image has to be uploaded into /images/logos/ in your forum directory.